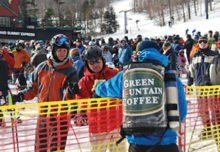 It is the largest sponsor at the 2010 Winter Olympics, using the Games as a platform for brand growth, b-to-b hospitality, technology showcases and yes, sales generation. For Bell Canada, the Vancouver Games is an opportunity that couldn’t be passed up. 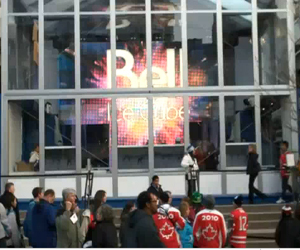 Those on the ground at the Games find the Bell Canada brand, literally, everywhere. As an example, we point you to the Bell Canada Ice Cube, a custom-built fan experience located steps from BC Place and positioned as a fan destination for the world. 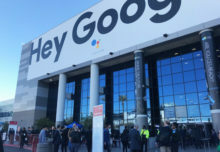 Thousands line up for hours to get into the space, a brand pavilion in which consumers can check out the company’s products and services, watch Olympic action and enjoy the spirit of the Games. Consumers enter the space through a sleek lobby boasting a floor-to-ceiling LED screen. Here’s the cool part: Once inside, they receive a free branded pair of ear buds that serve as their connection to the content inside. How? Each interactive, kiosk, station, and HDTV has an ear bud plug (some hanging from the ceiling) guests use to “plug into” the Ice Cube. A nice touch, one that allows each consumer to have a personalized experience while preventing the noisy mess of chaos that too many brand experiences have suffered from (Daytona 500 fan zone, you know who you are). 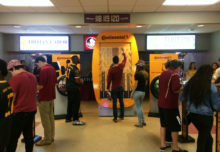 Inside are rows of televisions broadcasting content, phones and devices to demo, activities to participate in, and an area used for daily celebrity and athlete meet and greets. The Cube is open late, and the lines just won’t quit.